With charming cut-paper collage illustrations, Honk, Honk, Goose! Canada Geese Start a Family is an adorable picture book which takes us from the mating of two geese to the birth of their six babies, and chronicles the perils they encounter along the way. The two geese must remain ever-vigilant, to protect their eggs from muskrats, turtles, and raccoons. 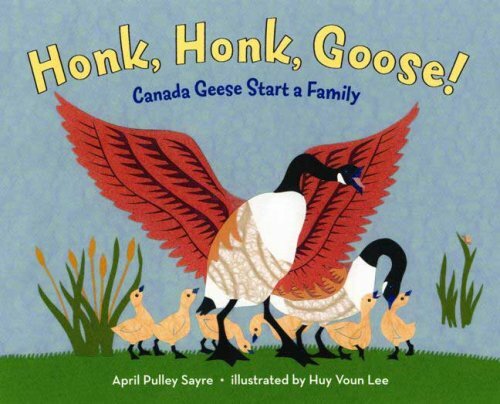 This is sure to be a fun read aloud book, with the all of the “honking” done by the male goose: he honks to attract a female, he honks to protect his eggs, and at the end of the book he honks to guard the baby geese and their mother as they rest. The illustrations, which are simple and elegant, really complement the text well. Because there is so much going on in the story, I think the temptation would have been to make them more busy. Instead, the understated, more muted colors tell the story without making it overwhelming. At the end of the book, there are a couple pages detailing the science behind the book, describing the mating patterns of the geese as well as providing some history. This book is another great selection for Earth Month, as it talks about how people took action to save the disappearing Canada Geese population about 100 years ago. I think my favorite part was the charge at the end of the book to Young Scientists, encouraging young ornithologists to study the behavior of the geese, as there has never been a long term study of them. What a great way to encourage taking an interest in nature!